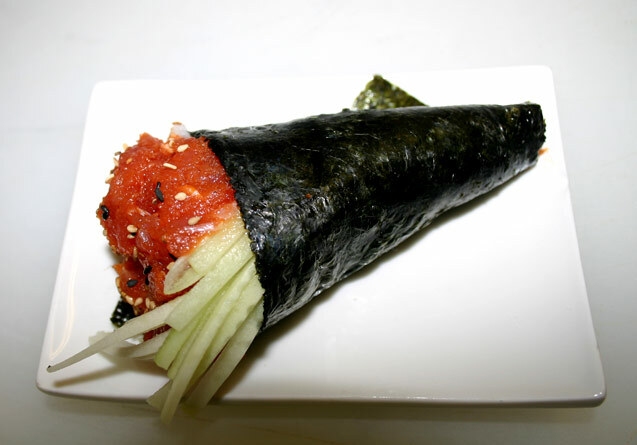 Sushi grade tuna with a spicy chili sauce, a hint of mayonnaise, toasted sesame seeds, and sliced cucumber make this fabulous tuna hand roll! These hand rolls make a great appetizer or yummy entree for two. You’ll need a clean and dry work space. Lay the seaweed paper horizontally. Spread a thin layer of rice on the left half of the seaweed. Mix the tuna, mayo, sriracha, and sesame seeds. Spread a thin layer of tuna on top of the rice. Top the tuna with some cucumber slivers. Tightly roll up the bottom left corner of to the top right edge of the rice and continue to wrap until seaweed is wrapped completely around. Serve with a dish of soy sauce.